Thanks for swinging by and checking out my latest reviews!! ARE YOU GOING TO THE DANCE? I was introduced to Jeanmarie Hamilton by way of author Diana Cosby’s Newsletter. The Fates seemed to align and I won her debut novel, SEDUCTION. After reading the first few chapters, I was seduced by Jeanmarie’s fresh voice. 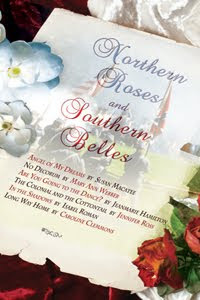 Intrigued by her flesh and blood characters and inventive plot-lines, I didn’t hesitate to read ARE YOU GOING TO THE DANCE, Jeanmarie’s contribution to The Northern Roses and Southern Belles Anthology published by The Wild Rose Press. When a band of raiders invade the township, Lexie Perreau is forced to stand her ground against her town and the local militia in defense of her Lipan neighbors. Lexie, a courageous spitfire, strives to convince the militia leader, Clayton Majors, the peaceful natives are innocent of marauding local farms. Clayton Majors carries a heavy burden. Widely respected for his forthright genteel, he’s been charged with hunting down the band of raiders. Despite himself, Clay is unable to deny his attraction to the woman who thwarts all his good intentions― the spirited Lexie Perreau. Flaring tempers give way to a fiery passion, but is the budding romance between Clay and Lexie strong enough to survive the differences threatening to separate them?